Saving lives every day! Helping patients’ within the community who suffer a serious injury or illness. Using alternative pathways to avoid unnecessary hospital admissions. SECAmb responded to 1,016,942 emergency calls in the last financial year 2016/2017 covering a geographical area of 3,600 square miles across Sussex, Surrey, Kent and North Hampshire. The crews work from one of 110 Ambulance Stations/Make Ready Centres and Area Response Posts, serving a population of 4.5 million people - any of whom could need their emergency support at any time. Our patients range from the critically ill and injured who need specialist treatment, to those with minor healthcare needs who can be treated at home or in the community. Around 3,300 staff are employed by SECAmb. Approximately 87% of this workforce is Operational. SECAmb also has an additional network of Community Responders. Patients are at the heart of everything SECAmb does and the service has an excellent reputation for spotting technologies and techniques of the future and fast-tracking them into practice. Recent innovations to have benefited South East Coast patients include new treatments for people suffering from strokes and heart attacks as well as community access defibrillators. 999 Calls are received by one of two Emergency Dispatch Centres (EDC), whereby the call details are taken and the nearest front-line-crew is alerted to respond as quickly as possible. The calls are triaged on the phone to ensure the most appropriate resource is arranged and this may be anything from an ambulance to home management advice. 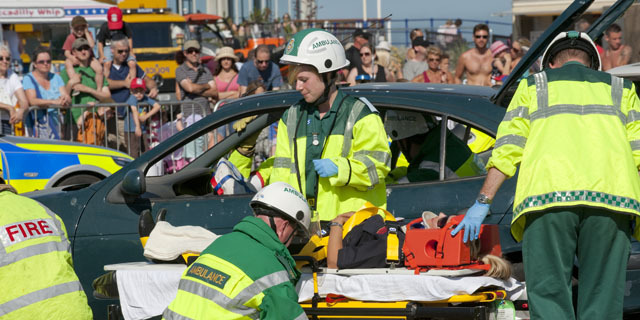 Emergency Care Assistants (ECAs) and Emergency Care Support Workers (ECSWs) - drive ambulances under emergency conditions and support the work of qualified ambulance technicians and paramedics. Technicians - respond to emergency calls as well as a range of planned and unplanned non-emergency cases. They support paramedics during the assessment, diagnosis and treatment of patients and during the journey to hospital. Paramedics – respond to emergency calls and deal with complex non–emergency hospital admissions, discharges and transfers. They work as part of a rapid response unit, usually with support from an ambulance technician or ECA or ECSW. They meet people’s need for immediate care or treatment. greater patient assessment and management skills. They are able to diagnose a wide range of conditions and are skilled to treat many minor injuries and illnesses. PPs are also able to “signpost” care – referring patients to specialists in the community such as GPs, community nurses or social care professionals. They can also refer patients to hospital specialists, thus avoiding the need to be seen in A&E first. Critical Care Paramedics (CCPs) - are paramedics who have undergone additional education and training to work in the critical care environment, both pre-hospitally and by undertaking Intensive Care transfers between hospitals. Often working alongside doctors at the scene, they can treat patients suffering from critical illness or injury, providing intensive support and therapy, and ensuring the patient is taken rapidly and safely to a hospital that is able to treat their complex needs. They are able to assess and diagnose illness and injuries and treat patients using more powerful drugs and use equipment on scene that up to now was only used in hospital. Emergency Operations Centre staff – we have many staff who work in the Trust’s three Emergency Operations Centres in a variety of roles including Emergency Medical Advisors, Dispatchers, EOC Managers and Clinical Desk staff. These staff are responsible for receiving every one of the emergency calls received from the Trust, providing support and clinical advice to callers as needed and co-ordinating the most appropriate response to send to the patient. Community Responders are volunteer members of the local community, trained to respond to emergency calls in conjunction with the Ambulance service. Responders provide immediate care to patients in their local area suffering from a range of conditions. They are trained to deliver Basic Life Support as well as additional skills such as Oxygen therapy should it be required. Why do we need Community Responders? Community Responders are based within the Community that they work or live in. Therefore they can attend the scene of an emergency in a very short space of time, often arriving within a few minutes of a call. Our Community Responders often arrive within 4 to 5 minutes of an emergency call. When a Community First Responder is on duty, they are mobilised either by a Text Message or Telephone call from the Emergency Dispatch Centre in Lewes following a 999 call. They will proceed to the address given and provide immediate first aid to the patient requiring it. Ambulance crews will be mobilised at the same time to ‘back up’ the responding crew. Responders are not a replacement for the Ambulance Service, they will always be followed by a fully trained crew/vehicle.